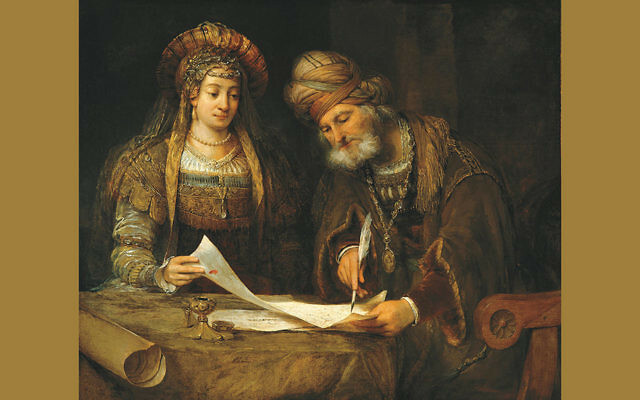 Among the many narratives of the Bible, an outstanding example of storytelling is the Book of Esther. Written not later than 350 BCE, this tale contains all the timeless literary devices of a well-constructed story: clever arrangement of plot; conflict and tension; dramatic irony and reversal; contrast; the use of time and shift of locale as suspense factors; dramatic action flowing out of believable characters: foreshadowing of events; and finally, a harmonious and well-balanced arrangement of scenes. From the opening description of the court and royal feast we learn that Achashverosh, the wealthy and mighty king of Persia and Media, does not force the revelers to drink the portion set before them. That strain of gentleness prepares us for his acquiescence in a forthcoming request from Haman. The Queen Vashti affair shows the king to be suggestible and foolish; he hastily disposes of his wife, and with similar dispatch later orders the Jews condemned to death. A proclamation is issued that henceforth men will wear the trousers in the family (1:22)—the tone is similar to the tone of the edict that later is issued against the Jews (3:12). Such satirical contrast of the banal and the serious is carefully arranged. Since one women’s refusal to obey may result in all women disobeying their husbands, an order is promulgated that applies to all women and their behavior toward their husbands. In a well-constructed tale, events naturally and inevitably concatenate. The king, now without a wife, must have a queen. A beauty contest is announced and Esther—advised by her uncle and guardian, Mordecai, not to reveals her Jewishness — wins. After Esther marries the monarch, Mordecai must be introduced. At the end of Chapter Two, Mordecai, a minor court official, unearths an assassination plot against the king. Instead of informing the ruler directly, Mordecai instructs Esther to bring the news to Achashverosh to get into his good graces. The characters thus are manipulated so that both Esther and Mordecai can win favor. The discovery of the plot, duly inscribed in the king’s Book of Chronicles, is pertinent to the story’s development and is an excellent example of literary foreshadowing. The main protagonists — the foolish king, the lovely Esther, the wise Mordecai — have made their appearance. But since there is no story without conflict — enter the villain, the antagonist. Chapter three introduces Haman, lately promoted in the hierarchy. All must now kowtow to Haman, for such is the king’s command. Only Mordecai refuses to comply. Here begins the tension, the essential ingredient to any tale. Mordecai is warned but he remains adamant. Haman, realizing that Mordecai does not bow because he is a Jew, becomes enraged. It is not enough to kill only Mordecai; he plans to destroy all the Jews at some time in the future. Lots — purim in Hebrew — are cast, and the pre-spring month of Adar is chosen. At first glance, this seems to be the weakest link in the chain of motivation. To vent his hatred against one recalcitrant Jew, why should Haman want to kill all the Jews? Since previously one woman’s action prompted a law for all women, a precedent for mass retaliation for one single person’s misdemeanor has been set. Both Vashti and Mordecai were part of the court hierarchy. If royal officials err — no matter what their rank — it sets a bad example. Therefore, they and the masses they represent must be taught a lesson. Since the insubordinate Mordecai is Jewish, Haman infers that the entire Jewish people are disobedient, and moreover, that their “laws are diverse” (3:8). He persuades the king by promising an enormous amount of silver to the royal treasury — booty from the slain Jews. The reader, recalling how precipitously Achashverosh acted with Vashti, is prepared for the king’s hasty agreement. With a brief but telling line the chapter concludes: “And the king and Haman sat down to drink, but the city of Shushan was perplexed…”(3:15). This is a hint that people in the city realize that a wrong had been committed against the Jews. In contrast to the opening moods of revelry and comedy, Chapter Four begins with mourning and pathos. The heroes’ reaction — the core of any drama — propels the narrative forward. It creates the stimulus necessary for continued reading. Mordecai tells Esther of the coming disaster and asks her to intercede for the people. Fearing for her own life, she does not immediately agree — a human failing that here, as in Biblical stories, is not muted. The king has not called Esther for 30 days. And no one may come before the king uninvited, on pain of death. Mordecai counters with the remark that Esther’s fate and her people’s fate are one. If she remains silent now, salvation will come to the Jews from another source; and perhaps it for this very reason that Esther has been made queen. Mordecai’s remarks are the story’s only hint of possible supernatural intervention. Esther rises to the occasion. She requests that the Jews in Shushan hold a three-day fast along with her. When the fast is concluded, she will go to the king. Now, at the midpoint of the story (5:2), when Esther is before the king, the reversal starts; the heroes rise, and the villain begins to fall. But Esther does not state her request immediately. She asks only for a private dinner for three — the king, Haman, and herself — for that evening. There she postpones her appeal until the following day, when all three meet again at a banquet. This artful postponement of action adds suspense and permits the inclusion of yet another strand to the story. Esther easily could have told the king what had happened to her people, and the king would have reacted the same way he did at the second banquet. But that would have spoiled the story, would have deleted the delicious scene where Mordecai’s ascent and Haman’s descent occur at the very same moment. The plot is structured like a pyramid. All events up to the time when the king can’t sleep are, let us say, the left side of the pyramid. Its apex is the recall of Mordecai’s beneficent deed when the Book of Chronicles is brought. And the slide down the right side of the pyramid commences when the king asks Haman what should be done to the person the king favors. The inevitability of events — now there is no turning back — flows until Mordecai and the Jews are victorious and Haman and his followers are defeated. After Esther’s first invitation we read that “Haman went forth that day, joyful and glad of heart” (5:9) — a wonderful bit of dramatic irony. The villain does not suspect that his presence at the banquet will initiate his downfall. It is interesting to note that each of the male protagonists has a woman who is involved with plot movement: King Achashverosh-Vashti; Mordecai-Esther; Haman-Zeresh. Three leading women characters balance out the three leading male characters. Now it is the turn of Haman’s wife, Zeresh. She and Haman’s friends suggest that a high gallows be prepared for Mordecai, a piece of advice that Haman heeds. The craft of fiction demands that some strands that later intersect should at first be left dangling. There are several such strands at the beginning of Chapter Six: What will happen at the banquet? Will Esther be able to save the Jews? Will Haman hang Mordecai on the gallows? Has Mordecai’s service to the king been forgotten? The writer picks up strand number four. Later that night, a few hours after having dined with Esther, the king has insomnia, and calls for his Book of Chronicles; literally, the Book of Remembrances. (The same Hebrew root for “remember” is used in the beginning of Chapter Two, when Achashverosh “remembers” Vashti, which prompts the search for a successor to the former queen.) 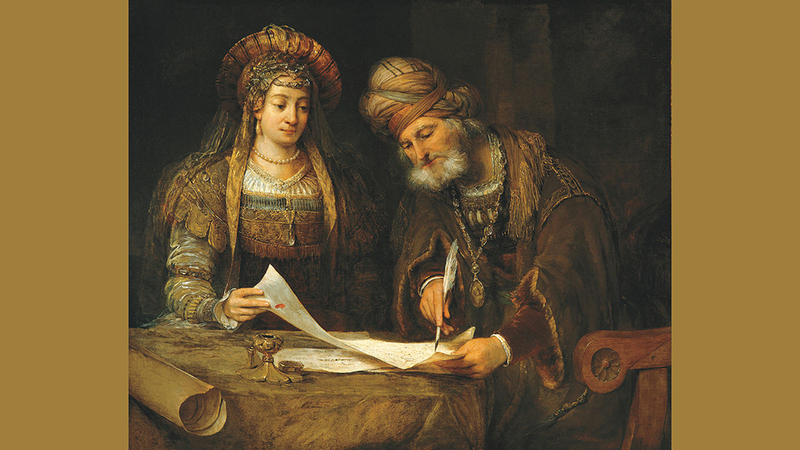 The reader knows that the king already has done something for Esther — he has made her queen. Haman, too, has been honored. Of necessity, Mordecai must now be raised. As the Chronicles are read, the king realizes that Mordecai has not been rewarded adequately for saving the monarch’s life. The king asks who is in the court. Fortunately, it is Haman, about to request that Mordecai be hanged for treason. At this moment, the villain and hero are at cross-purposes, a highly volatile and necessary situation for a good tale. The king asks his trusted adviser what honors to bestow upon a deserving man. Haman, vain and cocksure, thinks it is he who is being considered. He suggests something grand; that the man, royally clad, should ride on horseback throughout Shushan while all shout before him: “Thus shall it be done to the man whom the king delights to honor.” Then do so to Mordecai, the king tells Haman, and the story’s reversal continues. Thus, ironically, Mordecai’s antagonist not only unwittingly suggests the honor for his archenemy, but he is also the instrument for its execution. A few terse words depict Mordecai’s modesty. “And Mordecai came back to the king’s gate” (6:12). After being honored, he resumes his previous duties without any discernible change. But Haman, so high-spirited the previous day, hastens home in mourning (6:12). While Haman gives the king advice, back home his wife, Zeresh, who had given Haman advice about the gallows for Mordecai, now changes her mind. If Mordecai is a Jew, you don’t have a ghost of a chance, she tells Haman. No sooner does she chant this Cassandra-like dirge than the king’s messenger enters and hastens Haman to Esther’s second banquet. Note that this little section begins with Haman hastening home (6:12), and concludes with his being hastened away. Another example of the story’s irony are these carefully chosen words, a tongue-in-cheek parallel to the speed with which the couriers “hastened” (3:15) to spread the edict for the Jews’ destruction. At the second banquet, Esther says that her people are doomed and petitions for their lives. She chooses the right moment to reveal her heritage. The king asks who is the perpetrator of the crime. Esther points to Haman. Achashverosh rises in anger and leaves. This gives Haman an opportunity to humiliate himself. He falls on Esther’s couch to beg for mercy. When the king returns, he assumes that Haman was about to attack the queen. Haman’s end has come. The king, informed that gallows have been prepared for Mordecai, orders that Haman be hanged on them. The narrative draws to a close. The villain has been destroyed, but the evil he has set into motion yet must be stopped. The story interest does not lag, for Persian law dictates that a royal edict cannot be recalled. The most the king can do is to grant the Jews the right of self-defense. Again, the couriers hasten to deliver the news. Haste and speed are elements in the latter part of this tale. During the first half of the Book of Esther, until the scene when the king extends his scepter to Esther, time moves at a leisurely pace (5:12). The beginning is either measured in months — the 180-day banquet, the 12 months of purification during the beauty contest — or is marked by the biblical phrase “after these events,” indicating an indefinite time gap. Gradually, however, time becomes compressed. When Esther decides to go to the king, time is measured by days — the three days of fasting. From that point on, event follows event, not by the day but by the hour. With ever increasing intensity action occurs around the clock. Afternoon: Esther before the king. Middle of the night: Haman in the king’s chamber. Noontime: The crucial second banquet. Afternoon: Haman’s downfall; the new edict in favor of the Jews; Mordecai becomes the king’s right-hand man. Ironic reversal is a favorite literacy device of the author. Haman comes up to bury Mordecai, not to praise him, yet ends up honoring, not hanging him. The very gallows prepared for Mordecai are used to hang Haman; the Jews’ day of doom turns into a day of joy. Whereas before (3: 15) “the city of Shushan was perplexed,” now “the city of Shushan was glad and rejoiced”(8:15). In Chapter Nine, the story ends. The Jews defend themselves and are victorious. An epilogue is appended to the end of the tale. Purim is established as a holiday for all time. It is a day “of fasting and joy, and of sending portions to another and gifts to the poor” (9:22). In our story, all the characters act of their own volition. Inner human drives move them. Unlike other biblical stories, there is no deus ex machina. Not only is God not mentioned in the Book of Esther — the only book in the Bible without the word “ God” — there is no hint of any supernatural force. The Book of Esther opens with feasting and joy in Shushan and in the palace; it concludes with feasting and joy for the Jews of the Persian realm. Upon this artistically harmonious note concludes the Book of Esther, one of the most perfect narratives in the Bible. As a child, Curt Leviant, author of “A Novel of Klass,” spoke ancient Persian fluently. Today he can barely use it to say hello.